The Virginia basketball team spread joy around Wahoo nation Tuesday night with a win against in-state rival Virginia Tech. The Cavaliers won the top 10 showdown, 81-59, after exploding for a 22-point lead by halftime. That win set up a top 5 road duel with Duke on Saturday. So this is a good time for an “Ask The Sabre” segment presented by AskLandis.com. AskLandis.com is your full-service turn-key solution to help take back your home. From downsizing and decluttering to staging and moving and storage, they do it all. Why call five to 10 different companies when you can use just one? Give AskLandis a shot at your business. So with the Blue Devils on the horizon, here are a few questions and answers about the Hoos with Sabre Editor Kris Wright, and Sabre Associate Editor Chris Horne. Sabre Editor Kris Wright: A lot of that depends on whether Tre Jones plays or not because that could shift some matchups, in particular when Kihei Clark is in the game. With that caveat out of the way, plus the fact that I don’t think Jones will play, I think the matchups are an interesting question. You know that Zion Williamson, RJ Barrett, and Cam Reddish will start and it’s probably safe to assume that Marques Bolden slides into the first five as well since he’s started nine times. That’s the most of any non-regular starters. Do the Blue Devils go big across the board with Javin DeLaurier in too (he’s started seven times this season) or insert a guard as a first-time starter? I’m guessing it will be guard Alex O’Connell. So, the matchups I’d guess on at least at the start of the game would be Kyle Guy on O’Connell, Ty Jerome on Reddish, De’Andre Hunter on Barrett, Jack Salt on Bolden, and Mamadi Diakite on Williamson. I think you need Hunter on Barrett, the toughest shot maker in the group and I think the other matchups make the most sense, though I suspect that last one might raise some eye brows. My theory on this has various parts. By putting Diakite on Williamson, you can likely control dribble post-ups a little better than with Salt (Duke often tries to have it’s post players dribble into a post move from a few steps off the block to complicate any UVA plans to double the post), you have some length and quickness to try to bother Williamson’s shots, and you can bring Salt over to double team if you so choose because his timing and recognition are top notch. Plus, your first sub of Braxton Key for Diakite could quickly show Williamson a different style defender. My guess is that a combo of Diakite, Key, Salt, and Hunter all get chances on Williamson at times. That Hunter-Barrett matchup, by the way, is fascinating as both players could be NBA Draft lottery picks in a few months. Sabre Associate Editor Chris Horne: Both are matchup problems, but Williamson in particular is a matchup nightmare because of his unique combination of strength and athleticism. Barrett presents problems as well, but I think UVA could put Hunter, Key, and perhaps Diakite on him one-on-one and take its chances. Those three will be important against Williamson as well. As usual, though, it’ll be Virginia’s team defensive effort that’ll be most important in defending the Blue Devils. Sabre Editor Kris Wright: Isaiah Wilkins graduated and opened up a forward spot. Early, UVA tried Braxton Key in that role first as he started the first five games of the season. Mamadi Diakite started three times alongside Key early on while Jack Salt nursed a back injury. Then Key and Diakite gave way to Salt and Kihei Clark four a four-game stretch, during which Clark’s wrist injury occurred. 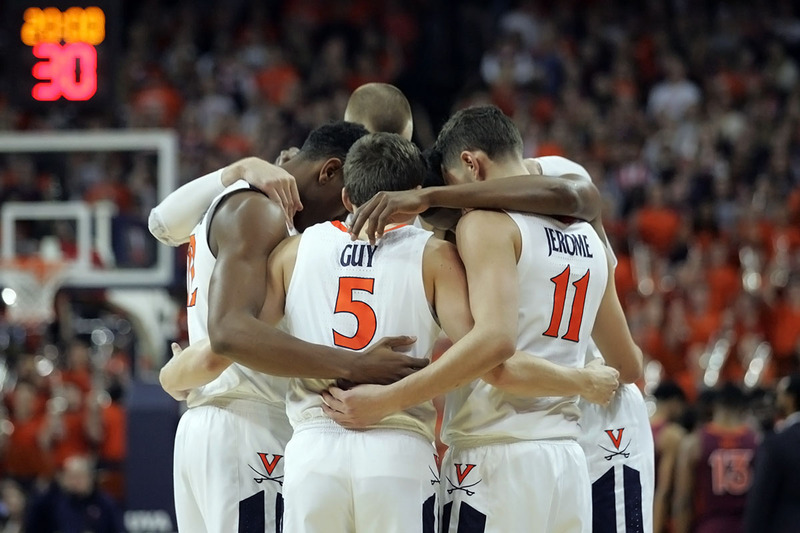 The two injuries plus the absence of Wilkins led to a lot of experimentation and combinations through the exam break, but since then the same five starters of Ty Jerome, Kyle Guy, De’Andre Hunter, Diakite, and Salt has settled in. Clark’s injury probably contributed to the change in part, but I think there’s more to it than that. First, I think Key’s defense wasn’t quite as good early before really picking up steam as of late. Second, with Diakite in the lineup early, you have a potential post feed player in on offense and that frees up spacing for the perimeter guys. Plus, after the VCU game, the last one Diakite didn’t start, Coach Bennett told reporters that he said to Diakite: “I said, ‘Mamadi, you know enough. Play hard and don’t worry about anything else.’ And I liked him defensively today.” In other words, Diakite appeared to turn a corner as of late, the Clemson game notwithstanding, and that makes him easier to pair with any combinations, including Salt. Sabre Editor Kris Wright: Building on the conversation above, I think the preference is to bring in Clark and/or Key first, sometime between the first two media timeouts. Those subs from what I can tell tend to be for Ty Jerome and Jack Salt or Mamadi Diakite, which may be foul trouble or matchup dependent. Bringing Clark in changes the defensive look because he picks the ball up so high, which almost always makes his first appearance an immediate interjection of energy for the whole team. Key, meanwhile, provides the possibility to go small and generally increase the potential for defensive pressure within the Pack Line. As for Jay Huff in the Virginia Tech game, a few things come to mind. One, Huff had earned an appearance in this game through his play at Clemson. Two, this game suited his skill set fairly well I think due to the way Virginia Tech plays. Three, if Huff is going to get some run, I think the target is between the 6:00 and 13:00 mark since that will usually put him on the floor in advantageous situations with other teams likely playing subs as well. Finally, Coach Bennett often will sub out a player right before a media timeout like he did in this case with Diakite. It gives them a little bit of an extended break with the upcoming media timeout adding some time to rest. In this case, Huff stayed on the floor for a while because he played well though. Sabre Editor Kris Wright: Without a doubt, it was all the extra passes on the perimeter. An extra pass is when a player is open for a partially contested shot against a rotating defender, but then moves the ball one more time to an often wide open teammate. UVA did this regularly in the first half and it lit things up from 3-point range as a result. Going 10 of 14 from 3 (71.43%!!!) in the first half wasn’t an accident in that sense. Loved the extra passes! Sabre Associate Editor Chris Horne: Quite a few to choose from. The Hoos played fantastic. One that keeps jumping out to me happened in the first half, when Kihei Clark was guarding Justin Robinson. Clark didn’t get the steal, but hounded Robinson, knocking the ball away twice after Robinson crossed half court. The Mongoose (or Cobra Ki-hei … I’m a sucker for The Karate Kid, lol) came up short on a diving attempt to secure possession; however, this was a statement play showing that Clark was not intimidated defending Tech’s standout senior leader. Clark’s 3 at the end of the first half – off a beautiful feed from Ty Jerome, right in front of Tech’s bench, giving UVA a 22-point lead – was nice as well. In general, it was good to see Clark and Jay Huff step up and play with confidence. Shedding the wrist brace seemed to spark Kihei for sure. Sabre Editor Kris Wright: I think that race probably comes down to Virginia, Duke, Tennessee, and Michigan plus maybe someone from the Kansas, Michigan State, Texas Tech, and Gonzaga pool unless someone like North Carolina or Kentucky strings together a bunch of wins. So from that standpoint, I’d say finishing in the ACC standings ahead of or even with Duke and UNC would probably do it. In the details, I think a split with Duke, a split with Louisville, and one of the UNC-NC State road combo appears to be the most important resume builders left other than the rematch with the Hokies. Sabre Associate Editor Chris Horne: I have no doubt that Bennett would consider a player like that, but will a player fitting your description – a tall, skilled wing with experience – be available in the transfer market? We don’t know the answer right now. If Hunter does turn pro, though, and a player like this does become available, I think you have to say there is a need based on the 2019-20 projected roster. No other current players have distinguished themselves to where you think they’ll be ready for a significant role next season. I’m thinking of Marco Anthony, Kody Stattmann and Francesco Badocchi. One of those players could emerge – Badocchi in particular intrigues me with his athleticism, if he can stay healthy – and may be impressing the coaches in practice, but based on what I’ve seen I think a need is there and I think Bennett would absolutely be interested.